The Overclocking World Championship (OCWC) Final 2017 will be broken down into two separate sections; a Qualification Phase, followed by a series of 1v1 Matches. Here is a general overview of the contest schedule. The following hardware restrictions will be enforced for the duration of the contest. Time for submissions: 4 hours. If the processor is damaged (read: does not function normally anymore), one single replacement will be provided for the next round. The participant is not disqualified nor loses the round, he may however be unable to continue competing depending on the damage. Participants must use the official wallpaper for a submission to be valid. After the Qualifier the CPU has to be given back to the Judge. Removal of the CPU, positioning and closing the lid on the HWBOT test setup is the responsibility of the participant. This action is performed only in presence of a judge or HWBOT Staff member. Thus no CPUs are accepted by hand. CPUs have to be verified on the spot for proper functioning. Round 1 and Round 2 of the Final phase will be played on Saturday 09/12 from 15:00 to 18:00. (Venue closes at 10pm). Round 3 to 8 of the Final phase will be played on Sunday 10/12 from 8:00 to 18:00. (Venue opens at 7am). Each Round will involve 30min prep, 30 min match, 30min clean up. One has 15 seconds to provide a clear reply. It will be repeated by the judge and can no longer be changed. No decision = Pass. 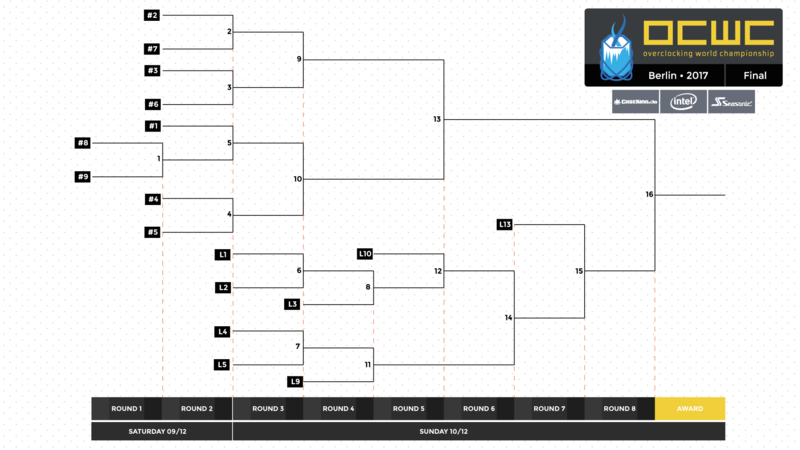 The draw priority is decided by the ranking position from the qualifiers phase. The Highest ranked from the qualifiers always gets to choose first. Once a benchmark is use for a match, it is taken out of the hat by the judge. It won’t be available for any further match of the competition. Each 1v1 match lasts for exactly 30 minutes. A benchmark run started before the end of the timer is allowed to complete past the end time. Contestants are allowed to draw a CPU 30 minutes before the start of each round. Contestants have at maximum 30 minutes to return the CPU used following the end of the round. This means there is a minimum of exactly 1h between each round. Prepared notes, usage of any aid device (laptop, smartphone,…) is only allowed during the qualifiers. Taking notes is allowed during the 1v1, though these can’t be re-used for the next round. No smartphone or laptop allowed during the finals. The system must be in the BIOS before the start of the match. Benchmarks screens have to remain visible at all times, no reducing or minimizing the window is allowed. For Cinebench, Realtime mode is not allowed. To qualify for the next round at least one score has to be submitted. Failing to submit a score results in losing the match. After each round (each 1v1 match) the CPU has to be given back to the Judge. Removal of the CPU, positioning and closing the lid on the HWBOT test setup is the responsibility of the participant. This action is performed only in presence of a judge or HWBOT Staff member. Thus no CPUs are accepted by hand. CPUs have to be verified on the spot for proper functioning. Judges must be informed of any damage/degradation/misbehavior right away. The below rules can be adapted/changed depending on the availability of hardware. It is the contestant’s responsibility to test and check that all his hardware is fully operational before the start of any round. It is the contestant’s responsibility to test and check that all the installed benchmark and software operates properly before the start of any round. No further than a 15 minute delay can be granted to resolve issues on the start of each round. If the processor is damaged (does not function normally anymore), no replacement will be provided. The participant is not disqualified nor loses the round, he may however be unable to continue competing depending on the damage. The processor will be replaced for the next phase of the competition (if spares are available). A maximum of one replacement per competitor will be provided. If the graphics card is damaged (does not function normally anymore), a replacement unit will be provided right away to the contestant by the staff. A maximum of one replacement per competitor will be provided. For OCWC 2017 Qualifier, the motherboard is not supplied. Contestants will use their own boards. The board must be Z370 chipset-based motherboard. If the motherboard is damaged (does not function normally anymore), no replacement willbe provided. The participant is not disqualified nor loses the round, he may however be unable to continue competing depending on the damage. The participant is allowed to replace his motherboard to a maximum of one single time per competition round. If the memory kit is damaged (does not function normally anymore), no replacement will be provided. The participant is not disqualified nor loses the round, he may however beunable to continue competing depending on the damage. The participant is allowed to replace his memory kit to a maximum of one single time per competition round. A Clean Windows 10 Pro 64bit SATA SSD identical to all 1v1 contestants is provided in the morning of both the Qualifiers and the Final phase (1x new drive for each day). The drive comes with all the necessary benchmarks. It is the contestant’s responsibility to test all the benchmarks upon reception of the drive and install himself all the necessary drivers and tools for his hardware prior to the rounds. A spare SSD can be requested at any time. E.g. if needed to debug a potential problem during the round or round preparation, again depending on availability. Only OS drives provided by the organizers are allowed for this event. Contestants are allowed to clone (under judge control) their competition drive in order to have a spare drive ready with all drivers and tools for their system. A cloning station will be made available on site. Depending on spare availability, the damaged item may be replaced after approval of the judge. Maximum one replacement per contestant. The aforementioned still applies even if there are more spare units. The participant does not lose the round for an approved hardware swap.